The administration of University of Nebraska-Lincoln refuses to acknowledge the accomplishments of their most publicly violent student. It’s such a good photo of Dan Kleve too. 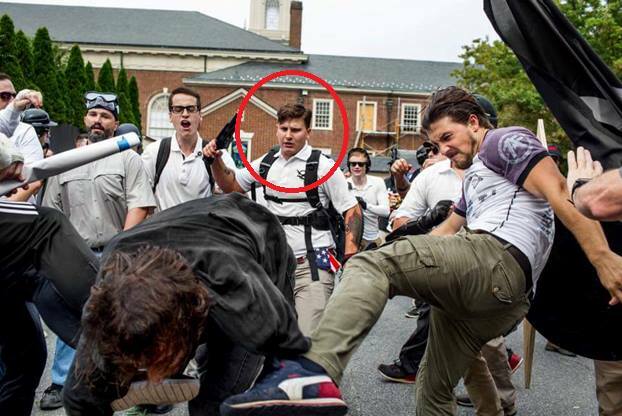 The photo was taken in Charlottesville, VA on the morning of August 12, 2017 during the “Unite the Right” rally that turned deadly later in the day when James Fields drove his Dodge Charger into a crowd of anti-racist counter-protesters. In the photo it is still unclear who the two men kicking are, but the one in the center with a backpack raising his flashlight is Daniel Kleve. He’s an UNL student and was profiled by the Anti-Defamation League before the rally as a known hate group leader. This is the same university that state senators and the governor claim conservative students are “harassed” for their beliefs. A social media campaign brought hundreds or perhaps thousands of calls and emails to the University of Nebraska-Lincoln administration, to discipline and/or remove this violent student from campus. Administration officials responded that they would handle the incident being reported in various emails to those who contacted them. The victim shown, Jae Em Carico, gave this statement: I was on bond and incapable of fighting back. Unicorn Riot sent me footage indicating they [the Nazis] were definitely tracking me. David Duke had put me on his Twitter for defending myself against a Nazi at AmRen and Stormfront had written pieces on me for my work there the past few years. This guy needs to be punished. And if the school can’t handle it, we will. UNL has received numerous reports of concern about a student’s activities. There have been demands to remove this person from campus based on perceived safety concerns, affiliation with organizations, and ideologies. Safety officials have been aware and are taking the matter very seriously. Rest assured the safety of our students, faculty and staff is of utmost importance to us. We strongly denounce bigotry and condemn violence. We also object to activities that strike fear among our students. The campus is comprised of people of diverse backgrounds, with different life experiences. We encourage civil and respectful discussion of ideas and opinions, even if they may differ from our own. At UNL, we work hard to provide a safe and welcoming environment for everyone on our campus. We encourage the campus community to report concerns and any information helpful to this matter to University Police at 402-472-2222, the Office of Institutional Equity and Compliance at 402-472-3417, or anonymously at unl.edu/TIPS. We ask Huskers to come together to create the kind of place we call home. Tell the University, the Office of Institutional Equity and Compliance, and your senators this is the violence they are protecting, and their response is unacceptable. Violent Nazis aren’t welcome at UNL, or anywhere in Nebraska. For good measure, here’s a video of Kleve from January 2018, stating he wants to “be violent”. Share it with those administrators who are protecting him.